Telstra Broadcast Services is expanding the reach of its Global Media Network (GMN) by adding new partners in the Americas and Europe. Telstra’s GMN is a media contribution and distribution network that enables the delivery of live, linear and file-based media content worldwide, helping sports and entertainment companies reach viewers and sports fans in Asia and around the world. The GMN utilises Telstra’s global infrastructure including fibre cable networks, data centres and cloud platforms, combined with the networks, media assets and broadcast operations of partners. New partners include Gold Data, one of Latin Americas's leading telecommunications providers, Zayo Group, a major provider of American and global communications infrastructure, and Norkring, a division of Telenor that provides broadcast and connectivity services across the Nordic region. 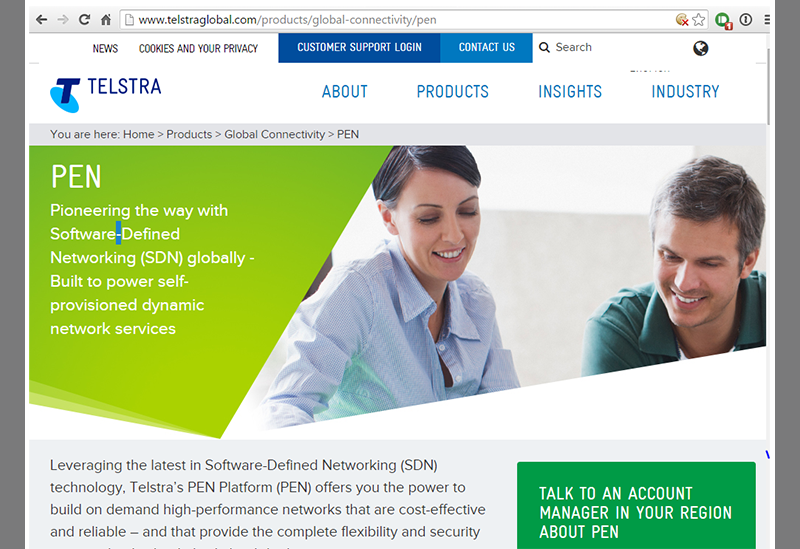 The new partners join a growing Telstra GMN partner alliance that includes The Switch, AT+T, TDF Group, NEP Connect, MTI Teleport Munchen, GlobalConnect, Nexion, Softbank, PCCW and China Unicom. 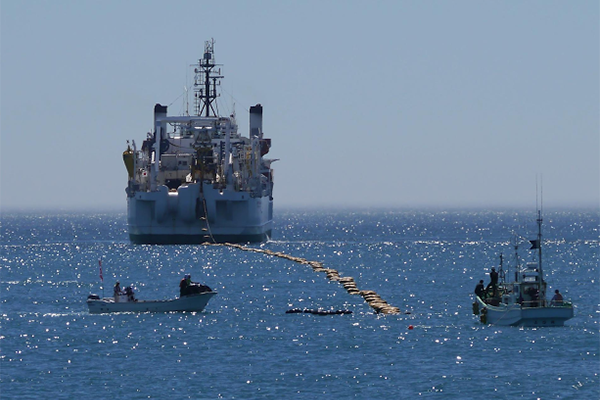 Telstra is introducing a new rapid restoration service on its busiest subsea cable routes in Asia based on Ciena’s GeoMesh Extreme solution. Ericsson is also a partner. Currently, Telstra’s assured availability “Always on” service - offers restoration within eight hours. Telstra’s new service will reduce that time from hours to minutes. Trials were held in December and the new service is now available on three of Telstra’s intra-Asia routes. “The Asian region presents one of the most challenging environments for subsea cable systems. 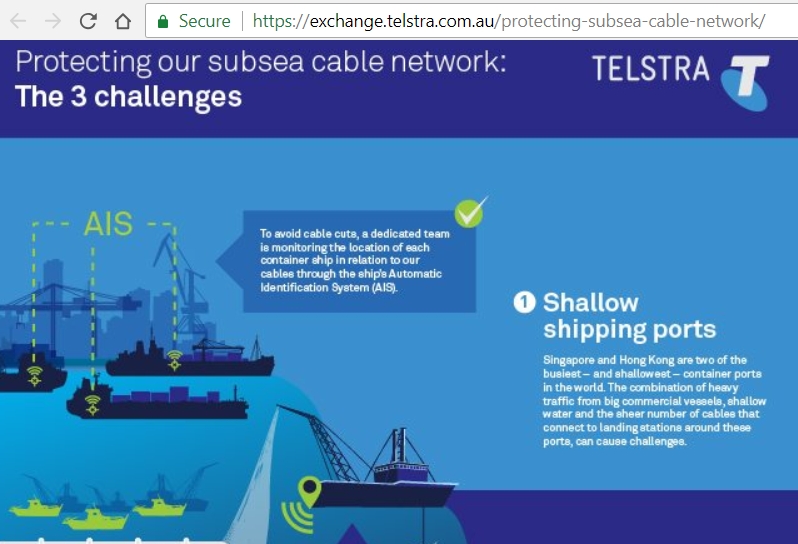 Busy and shallow shipping ports in Hong Kong and Singapore, high-levels of fishing activity and an ecosystem prone to natural disasters, all threaten to disrupt or damage underwater infrastructure,” said Nadya Melic, Telstra’s Head of Connectivity and Platforms. Telstra reaffirmed its commitment to maintaining the largest subsea cable network in the Asia Pacific region by announcing its first large capacity purchase on the new-generation New Cross Pacific (NCP) cable, and a further investment in the Faster cable. The 13,000-km New Cross Pacific Cable System offers landing points in China, Korea, Taiwan, Japan and the US. Existing consortium members include Microsoft, China Mobile, China Telecom, China Unicom, Chunghwa Telekom (Taiwan) and KT. FASTER is a 9,000km trans-Pacific cable connecting Oregon and two landing sites in Japan (Chiba and Mie prefectures). The system has extended connections to major hubs on the West Coast of the U.S. covering Los Angeles, the San Francisco Bay Area, Portland and Seattle. Its six fibre pairs offer a design capacity of 60 Tbps. Southern Cross -- in December, Telstra agreed to purchase a 25 percent stake in Southern Cross Cable Network (SCCN). This deal includes capacity on the existing Southern Cross network and new Southern Cross NEXT subsea cable - set to become the lowest latency path from Australia to the US. PLCN -- Telstra is making a 6Tb capacity purchase in the Pacific Light Cable Networks (PLCN) cable, both due to be completed in 2020. Indigo -- Telstra has a half fibre pair investment in the INDIGO cable system from South East Asia to Australia, which has reached a major milestone with the completion of the 4,600km Indigo West cable lay from Singapore to Perth just before Christmas. "Building on the capacity, resiliency and the footprint of our already vast subsea network is a key part of our international growth strategy,” stated Telstra Enterprise Group Executive Michael Ebeid. "Following Telstra’s purchase of Pacnet in 2015, we have strategically invested in additional capacity and infrastructure to meet the increasing demand for data right across the Asia Pacific region, carefully mapping our international paths and investment." Telstra acquired Pacnet Limited, a provider of connectivity, managed services and data centre services to carriers, multinational corporations and governments in the Asia-Pacific region. Telstra Group Executive, Global Enterprise and Services, Brendon Riley said Pacnet would be integrated into Telstra and the Pacnet brand progressively retired. Telstra will continue the development of the joint venture in China. US assets will be integrated when regulatory approval is obtained. Telstra also announced Asia's first Software-Defined Networking (SDN) Platform will now be available to customers globally, enabling high-performance, self-provisioned dynamic network services across 25 PEN Points of Presence worldwide. In December 2014, Telstra first announced plans to acquire Pacnet Limited, which owns and operates a pan-Asian submarine cable network and offers managed services and data center services to carriers, multinational corporations and governments across the region, for US$697 million acquisition is subject to completion adjustments. 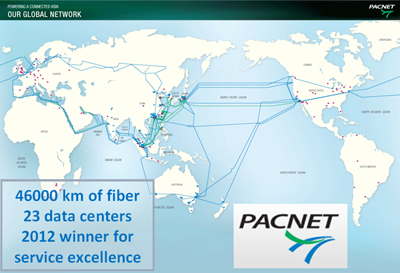 In addition to its submarine cables and 21 landing stations in China, Hong Kong, Japan, the Philippines, Singapore, South Korea and Taiwan, Pacnet’s core assets comprise an integrated network with 109 PoPs across 61 cities in the Asia-Pacific region, along with 29 data centers in key locations. Seven of the data centers have Tier III accreditation. In addition, Pacnet controls two of the five fibre pairs on the Unity trans-Pacific submarine cable network connecting Japan to the United States. In the year ended December 2013, Pacnet generated revenues of US$472m and earnings before interest, tax, depreciation and amortisation (EBITDA) of US$111m. Pacnet is headquartered in both Singapore and Hong Kong with approximately 815 employees across 25 offices (including PBS China). Telstra CEO Andrew Penn signed a 5G strategic partnership agreement President and CEO Ericsson Börje Ekholm. The signing ceremony coincided with Telstra activating its 50th 5G site in Australia. Canberra, Adelaide and Perth are among the first locations in Australia to be upgraded with 5G technology. Adelaide’s first mobile base station to be upgraded to 5G is located in Flinders St, with Perth’s first going live at Narrows Bridge in the Perth CBD. Canberra’s first 5G base station upgrade is at Pialligo, with other sites coming online at Phillip, Lyons and two sites at Fyshwick. The base station upgrades in these three cities means that Telstra has now upgraded 50 base stations to 5G technology across the country. Other locations include Brisbane, Toowoomba and the Gold Coast. Andrew Penn said 5G was a key element of Telstra’s T22 strategy and the decision to appoint Ericsson as its 5G technology partner was a critical one. “Telstra has a history of investing ahead of the technology curve to ensure we have the latest capabilities in place to serve our customers. 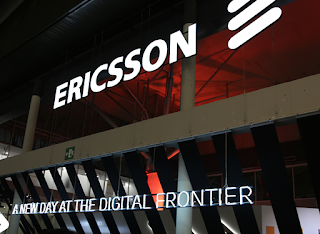 We're proud to partner with Ericsson to pioneer 5G technology in this country and to ensure that together we continue to deliver market leading innovation in networks,” said Penn. Telstra will deliver SD-WAN to more than 500 locations for Ruralco, one of Australia’s leading agribusinesses. Under the multi-million dollar deal, Telstra's SD-WAN connectivity will improve Ruralco’s operational agility, application performance and increase overall bandwidth to its outlets. It will also enable the roll out of an updated point of sales and customer relationship management solution. The partnership, which also includes 2,200 mobile devices, will improve access to technology services for Ruralco’s vast communities of customers across rural and regional Australia. The agreement will see all Ruralco’s technology services brought together under one partnership with Telstra simplifying its operations, which were previously managed by different providers as separate bespoke solutions. John Ieraci, Chief Customer Officer, Enterprise Australia, Telstra said, “Telstra has a long and proud history supporting customers and businesses in rural and regional Australia. By partnering with Ruralco we are helping to provide innovative technology services to the communities that provide critical services to the rest of the country." Ericsson and Telstra announced a technical milestone for extending IoT over long distances. The companies have deployed and tested Narrowband Internet of Things (NB-IoT) data connections up to 100km from a base-station in Telstra’s commercial network — the longest-range NB-IoT connection of its kind. Telstra said this helps extend its LTE footprint in rural and regional Australia. Ericsson notes the achievement extends the 3GPP standards-based limit from around 40km out to 100km and is activated entirely through software upgrades, with no changes required to NB-IoT devices. Telstra Broadcast Services has expanded the reach and scale of the Telstra Global Media Network (GMN) in Europe by building through partnerships with GlobalConnect, TDF Group, NEP, MTI Teleport Munchen and SIS Live. The expanded network, which includes existing partners The Switch and AT&T, will now deliver seamless feeds across Europe, USA and Asia connected by fibre enabling the creation and delivery of new services such as Ultra HD and 4K. Telstra's worldwide highly-resilient network is built on a four fibre system with 99.999% availability. Telstra has turned on 5G in selected areas on the Gold Coast. The pilot sites use Telstra's licensed 3.4GHz spectrum and are connected to its new modernised production core network. Telstra aims to have 200 5G-capable sites live around the country by the end of 2018.
the world’s first end-to-end 5G data call on a commercial mobile network. Michael Ebeid joins Telstra to run the Enterprise team servicing Australian and international business and government customers. Vicki Brady will continue to lead Consumer & Small Business designing digitally-led propositions. Nikos Katinakis joins Telstra in mid-October to lead Networks & IT focused on extending the company’s network superiority and enabling digital experiences. Brendon Riley will become the CEO of Telstra InfraCo, which will leverage the InfraCo assets and drive growth in the wholesale market. David Burns, currently with the Enterprise team, will lead Global Business Services (GBS). 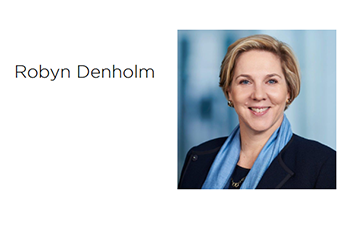 Robyn Denholm will move to the role of Chief Financial Officer & Head of Strategy. Alex Badenoch, Transformation & People will lead the T22 strategy transformation execution as well as drive the way the company works and operates, strengthening employee engagement. Carmel Mulhern, Legal & Corporate Affairs will continue in her role engaging external stakeholders, including relationships with government and community. “Last month I announced the T22 strategy to the market and today I am making furtherannouncements on Telstra’s structure and leadership to ensure we deliver rapidly and effectively on all of the commitments we made to our customers, the market and our team. At the heart of these changes is the simplification of our products and services built on newtechnology. By mid-next year we will have fully rolled out our market leading products and services. To help deliver these changes, we are announcing a new end-to-end products and technology division of Telstra. It means we will significantly increase our technical capabilities around product development and management," stated Andrew Penn. Almost exactly 8 years after signing a historic agreement with nbn Co Limited (NBN Co), the consortium established to design, build and operate Australia's wholesale-only national broadband network (nbn), Telstra has just announced plans to spin-off its remaining fixed network infrastructure, including long-haul fibre, data centres, and subsea cables, into a separate company. The nbn Co agreement reached in 2010 ensured that Telstra provides access to its facilities, which has remained a steady source of income over the years. Nevertheless, Telstra is embarking on a major reorganization and radical transformation of its customer plans and pricing. The company says it is looking ahead to a "post-nbn rollout" world in which very fast access speeds are ubiquitous across the country and multiple competitors run over the same fixed infrastructure. The corporate restructuring will result in a net reduction of 8,000 employees and contractors, and the elimination of 2-4 layers of management. 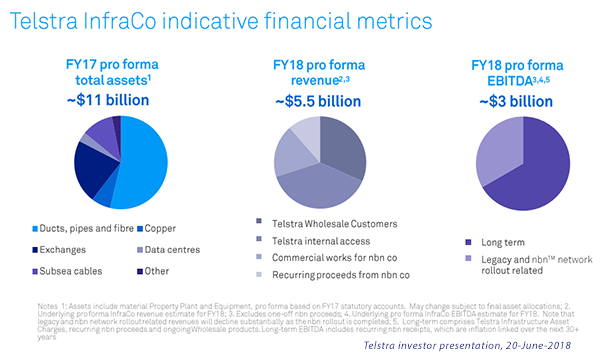 The infrastructure spin-off, tentatively called Telstra InfraCo, will begin as a wholly-owned subsidiary on 1 July, although over time, Telstra may seek a strategic investor or separate listing. 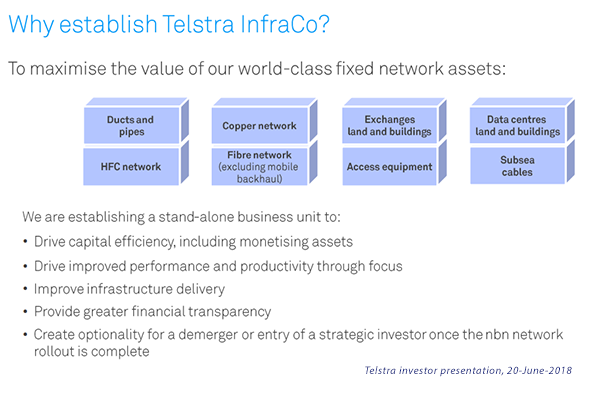 Its assets will include Telstra’s fixed network infrastructure including data centres, non-mobiles related domestic fibre, copper, HFC, international subsea cables, exchanges, poles, ducts and pipes. Its services will be sold to Telstra, wholesale customers and nbn co.
Telstra InfraCo will also comprise Telstra’s nbn co commercial works activities and Telstra Wholesale, with a total workforce of approximately 3,000. It is expected this new Business Unit will control assets with a book value of about $11 billion and have annual revenues and EBITDA of about $5.5 billion and $3 billion respectively. The new business unit will not include the mobile network assets including spectrum, radio access equipment, towers and some elements of backhaul fibre, which will remain integrated with Telstra’s core customer segment. Telstra itself will seek to be a premium brand with its future tied to mobile connectivity and the upcoming 5G launch. Ericsson, Telstra and Intel completed the first end-to-end 5G non-standalone (NSA) 3GPP data call on a commercial mobile network at Telstra’s 5G Innovation Centre on the Gold Coast Australia in a multivendor setup. "Demonstrating this 5G data call end-to-end using my own personal SIM card on Telstra’s mobile network is the closest any provider has come to making a ’true’ 5G call in the real world-environment, and marks another 5G first for Telstra. We continue to work with global technology companies Ericsson and Intel as well as global standards bodies to advance the deployment of commercial 5G capability in Australia,” stated Telstra’s Group Managing Director Networks Mike Wright. Telstra activated LTE-Broadcast (LTE-B) technology nationally in its mobile network. Customers using Samsung Galaxy S8 and Galaxy S9 devices can now view HD streaming using the AFL Live Official app. Telstra is conducting a live demo in Sydney featuring over 100 Samsung Galaxy S8 and Galaxy S9 devices running the app and using LTE-B. “With the success of our AFL, NRL and Netball apps, we are now streaming live sports content to a massive base of around 1.2 million devices and sports fans consume 37 million minutes of live content over our apps on any given weekend. This season we’ve seen an overall 58 per cent increase in customers streaming games. In some instances, more than twice the number of customers have streamed, compared to the same clash last year,” said Mr Wright, Group Managing Director Networks. “We have invested in network capacity and continue to optimise our network to meet the demand for video sporting content for subscribers of the AFL, NRL and Netball Live Passes. Last year we announced 1.5 million subscribers and this year we are on track to see a significant increase. Most recently, we have integrated LTE-B technology into the AFL Live Official app, which is delivering better quality video and audio experience for broadcast content, even in high traffic areas,” said Mr Wright. Telstra has launched its first smartphone plan with unlimited data. The Endless Data BYO personal smartphone plan is priced at Aus $69 with a 12-month contract, but after 40GB, speeds are capped at 1.5 Mbps and slowed further during busy periods. The plan also comes with unlimited talk, text and MMS to standard Australian numbers plus exclusive extras available to Telstra mobile customers – including unlimited Wi-Fi data at more than one million Telstra Air hotspots around Australia and access to every AFL, NRL and netball game this season live and fast. “We have invested billions in our network, pioneered world-leading 4G speeds and pushed our 4G coverage out to more than 99 per cent of the population. We are now introducing the unlimited plan Australians tell us they want while maintaining the superior network experience they expect," stated Vicki Brady, Group Executive of Telstra Consumer & Small Business. Telstra has expanded its "Always On" service to provide more bandwidth options and lower latency on some of Asia’s busiest subsea cable routes – Hong Kong to Singapore and Japan to Hong Kong. The service uses Telstra’s cable network in the Asia Pacific region to reroute traffic to another path, even in the event of a cable cut or damage due to a natural disaster. Telstra also claims to have the lowest latency routes between key financial hubs in the Asia Pacific region. “We now have average speeds of 28.8m/s between the Singapore (SGX) and Hong Kong (HKEX) Exchanges, 177.8m/s between the Australian (ASX) and Chicago (CME) Exchanges, 178.2m/s between Equinix/CERMAK (EQCH) in Chicago and the ASX, and 41.9m/s and 13.9m/s respectively between Singapore to Taiwan and Hong Kong to Taiwan,” said Abfalter. 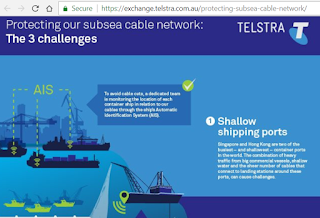 Telstra’s subsea cable network is the largest and most diverse in the Asia Pacific, accounting for up to 30 percent of active intra-regional capacity. Telstra has partnered with Microsoft to deliver native voice calling services from the Microsoft cloud with the launch of Telstra Calling for Office 365. The Telstra Calling for Office 365 service, which will be available for Telstra’s Australian business customers from the middle of 2018, lets customers securely access cloud collaboration tools combined with voice infrastructure. “We are always looking for ways we can make it easier for our customers to connect. Telstra Calling for Office 365 brings the full scope of Office 365’s cloud productivity and collaboration apps – including video conferencing and meeting broadcast capabilities – alongside Telstra voice calling. By combining what have traditionally been separate collaboration channels, we’re helping to increase productivity while simplifying the experience for employees," stated Michelle Bendschneider, Executive Director of Global Products, Telstra. Telstra has measured downlink performance to a Samsung Galaxy S9 in excess of 1 Gbps. The tests were conducted on the Telstra 4GX service. Telstra’s gigabit-enabled coverage is available in the Sydney and Melbourne CBDs (3km radius), Brisbane and Adelaide CBDs (2.0 km radius), and a number of sites in selected high traffic locations. Gigabit LTE deployment is also underway in the Perth CBD. “Cracking the magic gigabit mark on smartphones is an exciting milestone. As smartphones evolve and we move into the 5G era there will be a new raft of sophisticated features that are enabled by reliably fast data speeds. High-quality augmented reality, virtual personal assistants that anticipate needs and virtual doctors that monitor vital signs are just some of the technologies that are on the horizon,” stated Kevin Teoh, Telstra’s Head of Mobiles. Telstra opened a 5G Innovation Centre at its Southport Exchange on the Gold Coast..
“Telstra has already conducted Australia’s first 5G field trial and the world’s first 5G outdoor data call over 26GHz ‘mmWave’ radiofrequency spectrum. From our new 5G Innovation Centre we will be completing a number of 5G firsts in 2018 to ensure Australia remains at the forefront of mobile technology,” said Robyn Denholm, Chief Operations Officer, Telstra. Telstra, Ericsson, and Ciena demonstrated 400 Gbps speeds over 61.5 GHz spectrum on Telstra’s transmission network in Melbourne, attaining what the companies termed "the highest spectral efficiency per fibre pair ever achieved in a live environment." This implies that a maximum 30.4 terabit per second (Tbps) bandwidth is possible on Telstra’s transmission network in Melbourne. The highest previous mark was 25.6 Tbps. Ciena said that result was made possible through the deployment of software programmable 400Gbps wavelengths using Ciena’s WaveLogic Ai modem technology on the 6500 Packet-Optical Platform, in combination with Ciena’s Blue Planet Manage Control Plan (MCP) and Liquid Spectrum applications. Ericsson provides end-to-end systems integration. Telstra has deployed Ciena's programmable coherent modem technology, which offers up to three times data capacity and enables up to 60 percent reduction in power per bit compared to the modem technology currently deployed in the Telstra network.